Darragh MacAnthony has laid down a clear set of goals for next season. 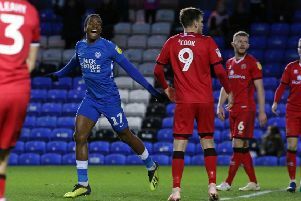 The Posh chairman hopes to see the club mount a serious League One challenge while returning to the free-scoring attacking football that helped to earn three promotions in the past decade. MacAnthony is often criticised for over-hyping the club’s prospects, but he was not afraid to talk up their 2017-18 chances during a Periscope session earlier this week. “Hopefully exciting times are around the corner,” said MacAnthony.”I went away from the hype last season, but I’m not going to do that again. “I expect us to score a lot of goals, to win a lot of football matches, to be promoted and to make headlines for the right reasons. “If we get the targets we’re chasing, I’m confident we’ll be right up there. We’re going to get some nos, but let’s hope we get a few yesses too. “We moved fast to make two great additions bringing Danny Lloyd and Ricky Miller in, but we still want to bring in four or five more players who we feel are right for our squad. “We’ve put out contract offers to another goalkeeper, a centre-back, a right wing-back, a holding midfielder, a number 10 and a striker. MacAnthony revealed that Posh have ditched the diamond. He confirmed that system is not one of the two formations the club is likely to employ next term. He also confirmed the club will operate with a smaller squad and are working hard in all areas to ensure there is not another post-Christmas nosedive in form. “The manager has two formations in mind and neither of them are the diamond,” added MacAnthony. “I think we can expect more width, more excitement and more goals. “We want to go with a much smaller squad than we have had of late. It’s about focusing on a core group of around 18 players. “We have to solve the problem of why we fall away from January onwards. From sports science to coaching to recruitment, we have to do a better job to make sure it doesn’t happen again. “We need stronger characters for when the going gets tough. We’re targeting people who fit the bill and have done well at other clubs. The chairman also expects plenty of the club’s transfer-listed players to move on before the start of the new campaign.